Shelton Hank Williams, III, the rambunctious grandson of country royalty, released his fourth self-produced record late last month. Damn Right, Rebel Proud is a hellbilly bender of smoking train beats and testimonials of losing control…and loving it. Just as tight and energetic as Shelton’s last album, Straight to Hell, I think Damn Right, Rebel Proud sounds like a belated second disc. Nashville session-god, Johnny Hiland, returns on lead guitar, firing his way through tracks like “The Grand Ole Opry”, “Me and My Friends”, and “P.F.F.”. The vocals are full of twang, dirt, and Shelton’s trademark evil delay and the band is as raucous as ever. Isn’t that everything you’d ever want? Earlier this year, Shelton joined a rally to reinstate his grandpappy, Hank Williams, Sr, back into the Grand Ole Opry (Hank was fired from the Opry in 1952 due to drug and alcohol problems). “Reinstate Hank” flyers can be seen all over Nashville, especially in lower-Broadway honky tonks. Shelton penned the first track of the album, “The Grand Ole Opry (Ain’t So Grand)” as awareness and protest to the organization’s refusal to accept Mr. Willams’ legacy back in to the Opry. 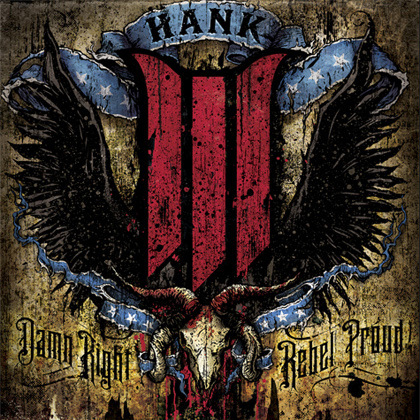 Between tracks covering protests, staying completely blitzed, and a tribute to punk rocker, GG Allin (just Google him), there are a few tracks on Damn Right, Rebel Proud that swing in a different breeze. I could honestly hear “I Wish I Knew” being played on the radio, with subject lines of a lost love rather than drugs. Shelton brings out his influences of Johnny Cash in “3 Shades of Black”, with just his acoustic and low, haunting vocals. Damn Right, Rebel Proud has got energy, its got substance, and its got some of the meanest guitar-pickin’ I’ve heard this year. Die hard Hank III fans have already gone nuts over it, swamping his website to see the video release of the album’s first single, “Long Hauls and Close Calls”. If you’re in the mood for a record that’s got enough fuel to keep you up for days, this is exactly what the doctor ordered.